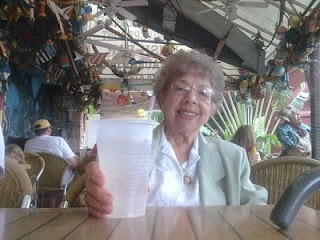 Last weekend Betty and I went to Briny's Pub in Ft Lauderdale. The place was not her first choice. She had no idea what an Irish Pub was, and at her Golden Girl status, I don't think she had ever gone to one. That fixed it for me, we had to go. Being an Italian Woman, she kept coming up with Italian restaurants and the BBQ joints up near her place in Century Village... sorry, Do Not Want! So once we got to Briny's she had sat down and took the place in. I could actually see her relax and her eyes get larger from all the wonderful collection of junk up on the ceiling. The place is right next to the Riverwalk, the boats sail by within 50 feet of where we were sitting, and we got to see the traffic on the bridge the entire time to add more to the whole experience. She didn't know what she would want at a place like that and when I described the Cod Fish slabs you get in their Fish and Chips, she came around. After all, take a dinner plate, plop down two expertly fried in beer batter fish slabs and a pile of french fries and you're in for a treat. Too bad they aren't serving "Pub Fries" any more, and went to the more American "shoestring fries". Not traditional and not as good. Today I went to visit Betty for what I think is the last time. We celebrated my birthday that is coming up over the weekend and had a massive meal at a Chinese Buffet. Not the same food, and I won't tell you what she had to drink at Briny's either since she really did enjoy both places. Betty is selling the condo, moving back to NY and will be near her children, grandchildren, and great grandchildren. She's also moving 1400 miles away from me. Assuming I get my life in gear to be able to go up to visit, it won't be before a year before I can. At 91, who knows. I hope that I can get back for her 100th birthday, I missed her 90th here in South Florida while she celebrated it in Lawn Guy Lant. The Condo Closes today, April 30th. She leaves for NY on May 1. I will miss her, I hope she's up to coming back next year as a snowbird. If so I'll get a chance to have more Fish and Chips with her at Briny's, tell people she had a Gin and Tonic under the awning there even if she didn't, and experience another chance to spend time with one of my favourite people even if she is a relative. Betty I'll miss you. Come back soon.